Sify Technologies is a well-established major information and communication technology (ICT) solution and service provider in India, with an excellent track record in managed hosting and network services. It targets enterprises and midmarket companies. It offers multitenant and single-tenant hosting services with data center presence in Mumbai, Delhi, Chennai and Bangalore and public cloud IaaS providers support for AWS and Microsoft Azure. It operates high-grade data centers in four major cities, with a disaster recovery service. Its cloud platform can support bare-metal services. It is getting more successful handling large or complex projects, including building community clouds for state governments. Sify is also commercially agile, and it has completed private cloud projects with usage or transaction-based pricing. 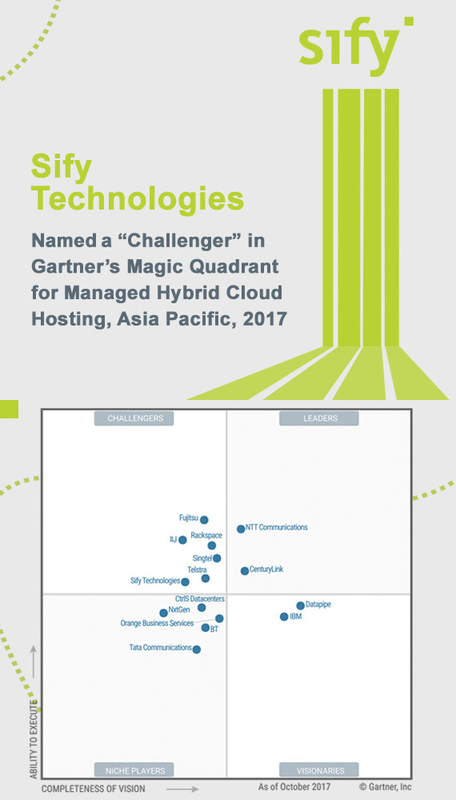 Download Gartner Magic Quadrant report and learn more about what Managed Hybrid Cloud Hosting can do for your organization. This graphic was published by Gartner, Inc. as part of a larger research document and should be evaluated in the context of the entire document. The Gartner document is available upon request from Sify. Gartner does not endorse any vendor, product or service depicted in its research publications, and does not advise technology users to select only those vendors with the highest ratings or other designation. Gartner research publications consist of the opinions of Gartner’s research organization and should not be construed as statements of fact. Gartner disclaims all warranties, expressed or implied, with respect to this research, including any warranties of merchantability or fitness for a particular purpose.